Indeed, an entire sub-community of professional officers and enlisted personnel are dedicated to this domain of information warfare. The great warrior-philosopher Sun Tzu said “one who knows the enemy and knows himself will not be endangered in a hundred engagements.” The Navy must understand the enemy, but also understand its own limitations and vulnerabilities, and develop suitable strategies to combat them. Thankfully, strategy and policy are core competencies of military leadership, and although information warfare may be replete with new technology, it conceptually remains warfare and thus can be understood, adapted, and exploited by the military mind. There are several cyber threats that the Navy continues to face when conducting information operations in cyberspace. Attacks against DoD networks are relentless, with 30 million known malicious intrusions occurring on DoD networks over a ten-month period in 2015. Of principal importance to the U.S. intelligence apparatus are nation states that conduct espionage against U.S. interests. In cyberspace, the Navy contests with rival nations such as Russia, China, Iran, and North Korea, and all are developing their own information warfare capabilities and information dominance strategies. These nations, still in various stages of competency in the information warfare domain, continue to show interest in exploiting the Navy’s networks to conduct espionage operations, either by stealing information and technical data on fleet operations or preventing the Navy from taking advantage of information capabilities. Non-state actors also threaten naval networks. Organized activist groups known collectively as “hacktivists,” with no centralized command and control structure and dubious, fickle motivations, present a threat to naval cyberspace operations if their goals are properly aligned. In 2012, Navy officials discovered hacktivists from the group “Team Digi7al” had infiltrated the Navy’s Smart Web Move website, extracting personal data from almost 220,000 service members, and has been accused of more than two dozen additional attacks on government systems from 2012 to 2013. The hactivist group boasted of their exploits over social media, citing political reasons but also indicated they did it for recreation as well. Individual hackers, criminal organizations, and terrorist groups are also non-state threat actors, seeking to probe naval networks for vulnerabilities that can be exploited to their own ends. 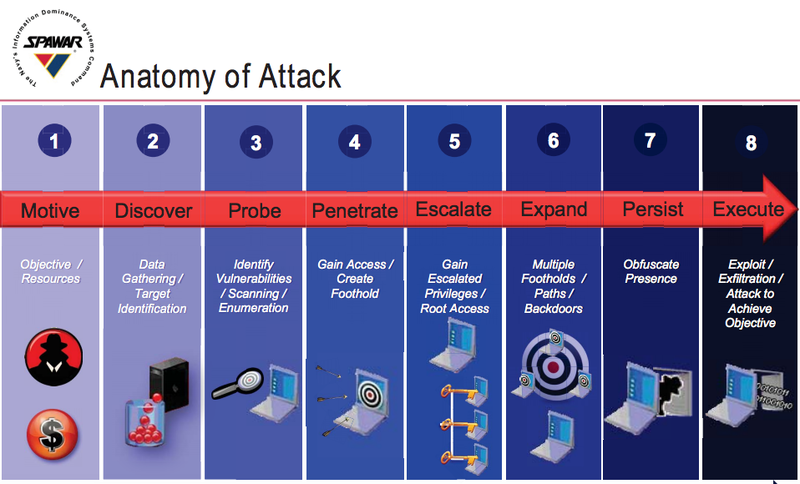 All of these threats, state or non-state actors, follow what the Department of Defense (DoD) calls the “cyber kill chain,” depicted in figure 1. Once objectives are defined, the attacker follows the general framework from discovery to probing, penetrating then escalating user privileges, expanding their attack, persisting through defenses, finally executing their exploit to achieve their objective. One of the Navy’s most closely-watched threat sources is the insider threat. Liang and Biros, researchers at Oklahoma State University, define this threat as “an insider’s action that puts an organization or its resources at risk.” This is a broad definition but adequately captures the scope, as an insider could be either malicious (unlikely but possible, with recent examples) or unintentional (more likely and often overlooked). The previously-mentioned Team Digi7al hactivist group’s leader was discovered to be a U.S. Navy enlisted Sailor, Petty Officer Nicholas Knight, a system administrator within the reactor department aboard USS HARRY S TRUMAN (CVN 75). Knight used his inside knowledge of Navy and government systems to his group’s benefit, and was apprehended in 2013 by the Navy Criminal Investigative Service and later sentenced to 24 months in prison and a dishonorable discharge from Naval service. Presidential Executive Order 13587, signed in 2011 to improve federal classified network security, further defines an insider threat as “a person with authorized access who uses that access to harm national security.” Malevolence aside, the insider threat is particularly perilous because these actors, by virtue of their position within the organization, have already bypassed many of the technical controls and cyber defenses that are designed to defeat external threats. These insiders can cause irreparable harm to national security and the Navy’s interests in cyberspace. This has been demonstrated by the Walker-Whitworth espionage case in the 1980s, Private Manning in the latter 2000s, or the very recent Edward Snowden/NSA disclosure incidents. The Navy’s vulnerabilities, both inherent to its nature and as a result of its technological advances, are likewise troubling. In his 2016 strategic design, Chief of Naval Operations Admiral John M. Richardson stated that “the forces at play in the maritime system, the force of the information system, and the force of technology entering the environment – and the interplay between them have profound implications for the United States Navy.” Without going into classified details or technical errata, the Navy’s efforts to secure its networks are continuously hampered by a number of factors which allow these threats a broad attack surface from which to choose. As the previous Chief of Naval Operations (CNO), Admiral Jon Greenert describes in 2012, Navy platforms depend on networked systems for command and control: “Practically all major systems on ships, aircraft, submarines, and unmanned vehicles are ‘networked’ to some degree.” The continual reliance on position, navigation, and timing (PNT) systems, such as the spoofing and jamming-vulnerable Global Positioning System (GPS) satellite constellation for navigation and precision weapons, is likewise a technical vulnerability. An internet search on this subject reveals multiple scholarly and journalist works on these vulnerabilities, and more than a few describe how to exploit them for very little financial investment, making them potentially cheap attack vectors. Even the Navy’s vast size and scope of its networks present a vulnerability to its interests in cyberspace. As of 2006, the Navy and Marine Corps Intranet (NMCI), a Government Owned-Contractor Operated (GOCO) network that connects Navy and Marine Corps CONUS shore commands under a centralized architecture, is “the world’s largest, most secure private network serving more than 500,000 sailors and marines globally.” That number has likely grown in the 10 years since that statistic was published, and even though the name has been changed to the Navy’s Next Generation Network (NGEN), it is still the same large beast it was before, and remains one of the single largest network architectures operating worldwide. Such a network provides an enticing target. The Navy employs the full litany of technical cybersecurity controls across the naval network enterprise, afloat and ashore. Technical controls include host level protection through the use of McAfee’s Host Based Security System (HBSS), designed specifically for the Navy to provide technical controls at the host (workstation and server) level. Network controls include network firewalls, intrusion detection and prevention systems (IDS/IPS), security information and event management, continuous monitoring, boundary protection, and defense-in-depth functional implementation architecture. Anti-virus protection is enabled on all host systems through McAfee Anti-Virus, built into HBSS, and Symantec Anti-Virus for servers. Additionally, the Navy employs a robust vulnerability scanning and remediation program, requiring all Navy units to conduct a “scan-patch-scan” rhythm on a monthly basis, although many units conduct these scans weekly. The Navy’s engineering organization for developing and implementing cybersecurity technical controls to combat the cyber kill chain in figure 1 is the Space and Naval Warfare Systems Command (SPAWAR), currently led by Rear Admiral David Lewis, and earlier this year SPAWAR released eight technical standards that define how the Navy will implement technical solutions such as firewalls, demilitarized zones (DMZs), and vulnerability scanners. RADM Lewis noted that 38 standards will eventually be developed by 2018, containing almost 1,000 different technical controls that must be implemented across the enterprise. Of significance in this new technical control scheme is that no single control has priority over the others. All defensive measures work in tandem to defeat the adversary’s cyber kill chain, preventing them from moving “to the right” without the Navy’s ability to detect, localize, contain, and counter-attack. RADM Lewis notes that “the key is defining interfaces between systems and collections of systems called enclaves,” while also using “open architecture” systems moving forward to ensure all components speak the same language and can communicate throughout theenterprise. The importance of open systems architecture (OSA) as a way to build a defendable network the size of the Navy’s cannot be understated. The DoD and the Navy, in particular, have mandated use of open systems specifications since 1994; systems that “employ modular design, use widely supported and consensus-based standards for their key interfaces, and have been subjected to successful validation and verification tests to ensure the openness of their key interfaces.” By using OSA as a means to build networked systems, the Navy can layer defensive capabilities on top of them and integrate existing cybersecurity controls more seamlessly. Proprietary systems, by comparison, lack such flexibility thereby making integration into existing architecture more difficult. Technical controls for combating the insider threat become more difficult, often revolving around identity management software and access control measures. Liang and Biros note two organizational factors to influencing insider threats: security policy and organizational culture. Employment of the policy must be clearly and easily understood by the workforce, and the policy must be enforced (more importantly, the workforce must fully understand through example that the policies are enforced). Organizational culture centers around the acceptance of the policy throughout the workforce, management’s support of the policy, and security awareness by all personnel. Liang and Biros also note that access control and monitoring are two must-have technical security controls, and as previously discussed, the Navy clearly has both yet the insider threat remains a primary concern. Clearly, more must be done at the organizational level to combat this threat, rather than just technical implementation of access controls and activity monitoring systems. The U.S. Navy has had an information security policy in place for many years, and the latest revision is outlined in Secretary of the Navy Instruction (SECNAVINST) 5510.36, signed June 2006. This instruction is severely out of date and does not keep pace with current technology or best practices; Apple released the first iPhone in 2007, kicking off the smart phone phenomenon that would reach the hands of 68% of all U.S. adults as of 2015, with 45% also owning tablets. Moreover, the policy has a number of inconsistencies and fallacies that can be avoided, such as a requirement that each individual Navy unit establish its own information security policy, which creates unnecessary administrative burden on commands that may not have the time nor expertise to do so. Additionally, the policy includes a number of outdated security controls under older programs such as the DoD Information Assurance Certification and Accreditation Process (DIACAP), which has since transitioned to the National Institute for Standards and Technology (NIST) Risk Management Framework (RMF). 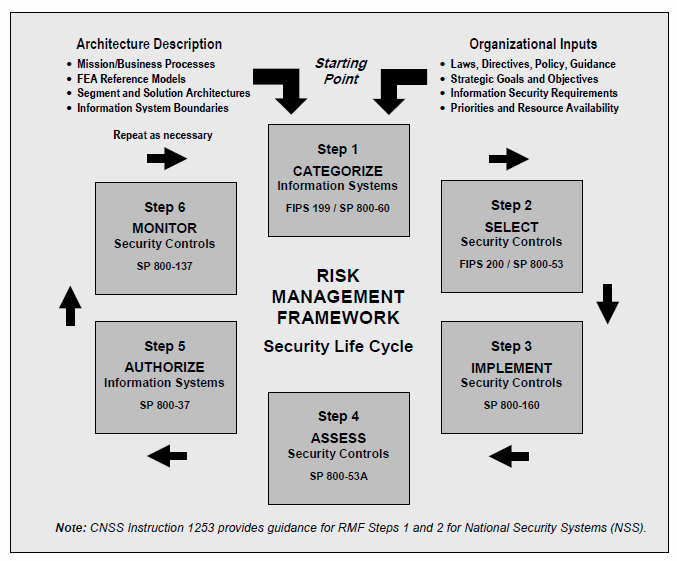 Beginning in 2012, the DoD began transitioning away from DIACAP towards the NIST RMF, making full use of NIST Special Publications (SPs) for policy development and implementation of security controls. The NIST RMF as it applies to DoD, and thus the Navy, is illustrated in figure 2. The process involves using NIST standards (identified in various SPs) to first categorize systems, select appropriate security controls, implement the controls, assess their effectiveness, authorize systems to operate, then monitor their use for process improvement.